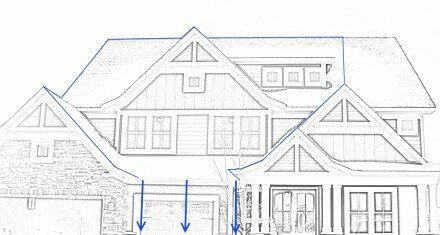 Here at Riverview Contracting, we are always on the lookout for advanced new products that benefit the construction process and your home. 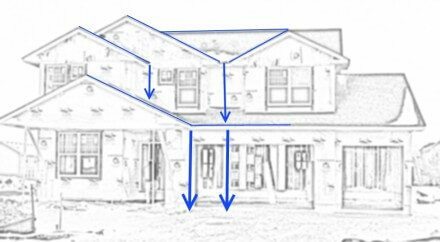 When it comes to protecting our homes from air and moisture infiltration, the building industry is quickly learning that there is such a thing as “too tight.” No matter how tightly a home is built, water is inevitably going to find its way in. And the tighter we build those walls, the harder it is to keep them dry. Attempting to stop all water and moisture completely is a recipe for disaster and a surefire way to ensure walls will get wet and stay wet. In many places, building codes are driving the need for better moisture management solutions. The International Residential Code (IRC) now requires the use of water-resistive barriers, but some states have added even more prescriptive measures to their codes that now include the use of drainage planes, and others are expected to follow. Thankfully, advances in material technology have resulted in innovative solutions for protecting our homes from the elements while also allowing them to both release vapor buildup and, in some cases, even drain bulk water. Though exterior cladding is the first line of defense against outside water infiltration, housewraps have become a popular way to block whatever water is able to sneak through. And as building assemblies have gotten tighter, housewraps have taken on a new function—helping to remove trapped water from the building enclosure. Their unique permeability enables them to both block moisture from the outside while also allowing walls to “breathe” to prevent vapor buildup. And the very latest innovations in housewrap technology is taking this moisture removal function one step further to incorporate drainage strategies, as well. Today’s most advanced housewrap products feature integrated drainage gaps through creping, embossing, weaving, or filament spacers. These new products eliminate the need for furring strips, helping to reduce material costs and streamline installation. Products that achieve a 1mm drainage plane, like TYPAR’s Drainable Wrap, can be as much as 100 times more effective than standard housewraps at removing bulk water from the wall. These new drainable housewraps meet all current code requirements for drainability (ASTM E2273) without sacrificing any of the durability and ease of installation benefits builders and contractors have come to expect from premium housewraps since they essentially handle and install the same. They are also vapor permeable, so moisture will not become trapped in the wall assembly and lead to mold or rot issues. 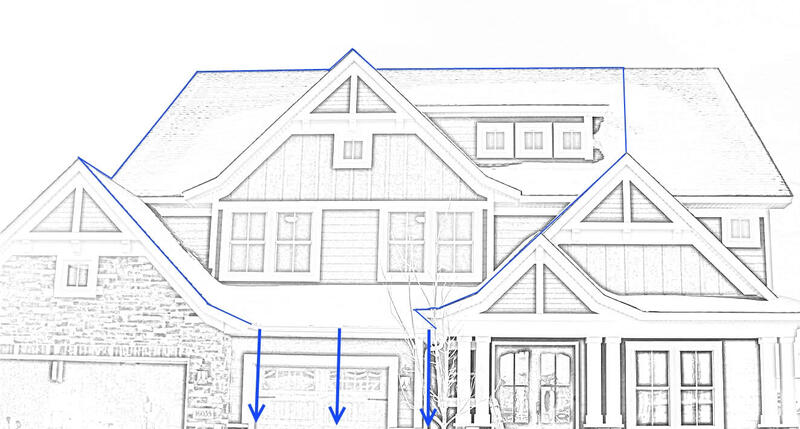 The ability to drain bulk water becomes even more important when installing a tightly fastened cladding such as cedar siding or fiber cement board, which could allow water trapped between the siding and a standard housewrap to pool. Drainable housewraps also work exceptionally well with reservoir claddings such as brick, stucco, and stone, providing a capillary break that prevents any stored water from being forced into the wall assembly. Advances in technology and building codes are driving adoption of better moisture management systems, and that’s a great thing. While we can’t completely stop water from getting into walls, there is certainly a lot more builders can do to help them dry out and minimize damage when they do get wet. By adding drainage capabilities to a solid mix of water resistance, durability and permeability, today’s newest drainable housewrap products are a terrific way to address this challenge. Water problems are often long lasting and hidden. Good construction will never allow water to enter or stand in your home. At Riverview Contracting we emphasize water management and prevention on all of our jobs. A homeowner uses a crow bar to remove window molding at a home that was damaged by water. The Texas towns and cities inundated by Hurricane Harvey’s torrential downpours are finally drying out, but the storm left a menace behind: mold. Just 24 hours after a heavy rain, as the Centers for Disease Control and Prevention and now many Texans can attest, the fungi can begin to grow and invade a home. Blossoming on walls, on furniture, on clothes and potentially in every crevice and corner of every soaked property, mold not only damages homes and businesses but affects human health. Exposure can trigger a stuffy nose, irritated eyes, cough or respiratory problems. Mold is so ubiquitous because it reproduces and spreads via pollen-like spores that are lightweight and travel easily through the air, thus exposing people through inhalation and skin contact. Complicating the situation: Those spores can last a long time. Indeed, all mold needs to survive and thrive is moisture, oxygen, a surface to grow on and a food source. Molds feed on dead, moist organic matter, including leaves, wood, cloth, paper, even dust. Smaller than the head of a pin, spores can hang in the air for hours — where they can be breathed or ingested. Dead spores still contain allergens and so can affect health, which is why it’s not enough to kill mold. It must be removed. Tillotson said he and his wife have suffered no ill effects so far. They quickly ventilated rooms, opened windows and turned on fans. They have already had the drywall stripped down to the studs and their hardwood floors removed. Methods to remove mold run the gamut. There’s simple, as in scrubbing with a fungicide mixed with bleach and water. There’s also complicated, which can involve wet vacuuming or vacuuming with a high-efficiency air purifier. Yet mold expert Nick Gromicko, founder of the National Association of Certified Home Inspectors, thinks some victims of Hurricane Harvey may not ever be able to remove all the mold. With thousands of homes and businesses along the Texas Gulf Coast unreachable for days — and perhaps uninhabitable for weeks or months — Gromicko said many structures likely can’t be rescued. Throw out items that cannot be washed and disinfected, such as mattresses, rugs and carpets, upholstered furniture and books. Remove and discard wet or contaminated drywall and insulation. Thoroughly clean all hard surfaces, including floors, wood and metal furniture, counters, appliances and plumbing fixtures, with hot water and laundry or dish detergent. River View Contracting takes water control very seriously. We adhere to strict guidelines when building to ensure your home project will not encounter water problems. Other companies may take shortcuts but we take the time to do it right! WHAT ARE THE MAJOR CAUSES OF FLOOD DAMAGE AND WATER DAMAGE? House flood water damage can be caused by a variety of factors, requiring you to find a reliable company to fix water damage. Some of these include heavy rain storms, burst or leaky pipes and malfunctioning appliances. House floods can also occur as a result of roof leaks and from defective gutters and downspouts which can cause water damage in your basement or crawlspace. CAN WATER DAMAGE BE HIDDEN? IF SO, WHAT ARE THE SIGNS? Some signs of hidden house flood water damage include peeling paint and wallpaper, visible mold, moisture and condensation, musty odors, and moisture or dampness in your carpet or other flooring. Water flood damage certainly has the potential to cause mold growth. Because mold thrives in moist environments, any place that is wet (and especially humid) is a perfect place for mold to grow. If you ignore the moisture, mold can begin to grow within 24-48 hours. It’s very important to take immediate action when you experience house flood damage of any type! HOW MUCH DOES IS COST TO FIX WATER DAMAGE? The cost of water damage cleanup depends on the size of the flooded area and amount of time needed to handle the water repair. If your insurance policy covers water damage restoration, you are typically only responsible for the deductible. Because water can move so quickly and be extremely destructive, if not promptly removed with the right equipment, there can be even bigger problems like mold growth and even structural damage. When done properly, fixing water damage can take several days and many man-hours to complete, which have varying costs. WHAT ARE THE DIFFERENT CATEGORIES OF WATER? Clean water – poses no harm to people. This includes water damage caused by a sink or bathtub overflow or an appliance malfunction, such as a water heater or washing machine. Gray water – can cause harm and illness to people. This category includes water that has a significant amount of contamination, which can be chemical, physical and/or biological. Black water – can cause severe illness to people. Black water is very unsanitary and contains pathogenic agents coming from other contaminated water sources. Black water can come from seawater, ground surface water and sewage backups. With all the news regarding Hurricane Harvey and homes being flooded, I wanted to post this article on Water Management in new home construction. 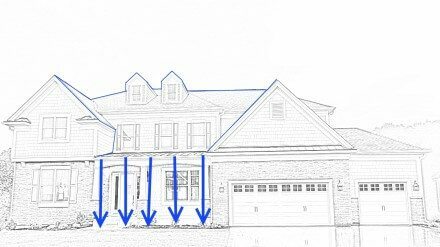 A common design for new houses is to concentrate rain water from several roof surfaces to a small area, which greatly increases the potential for foundation and basement water problems. 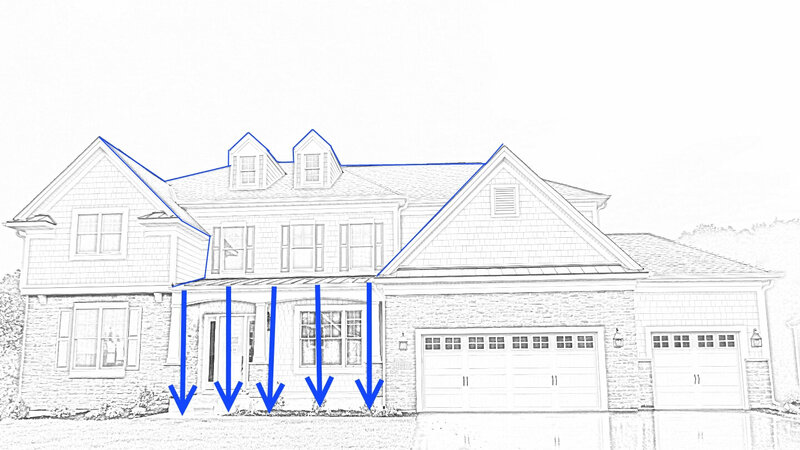 I marked up the images from some recent new construction to help highlight where a lot of water gets concentrated. 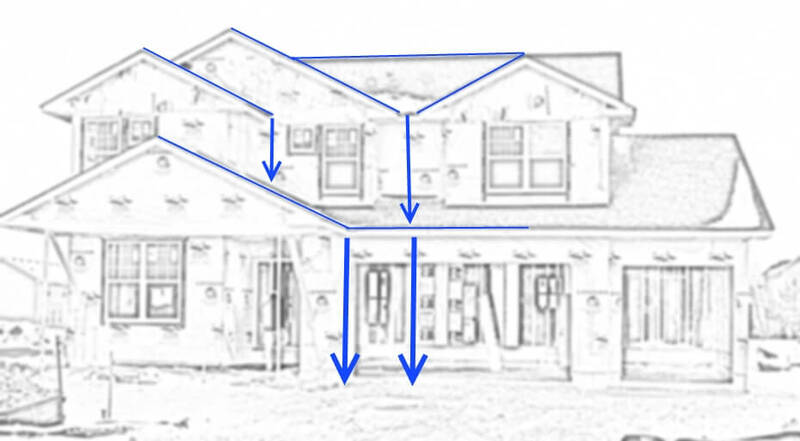 In the last image shown above, all of the water from the upper roof surfaces dumps onto the lower roof, and from there, it dumps onto the corner of the deck right by the patio door. When an invasive moisture testing is conducted in addition to home inspections, and without a doubt, one of the worst areas for water leakage is at the end of deck ledgerboards. I can almost guarantee that water is going to leak into this building before the year is up. Not only that, but this is also a recipe for basement water intrusion. To make things worse, the ground wasn’t properly pitched away from the building, and the soil was too close to the stone veneer siding. 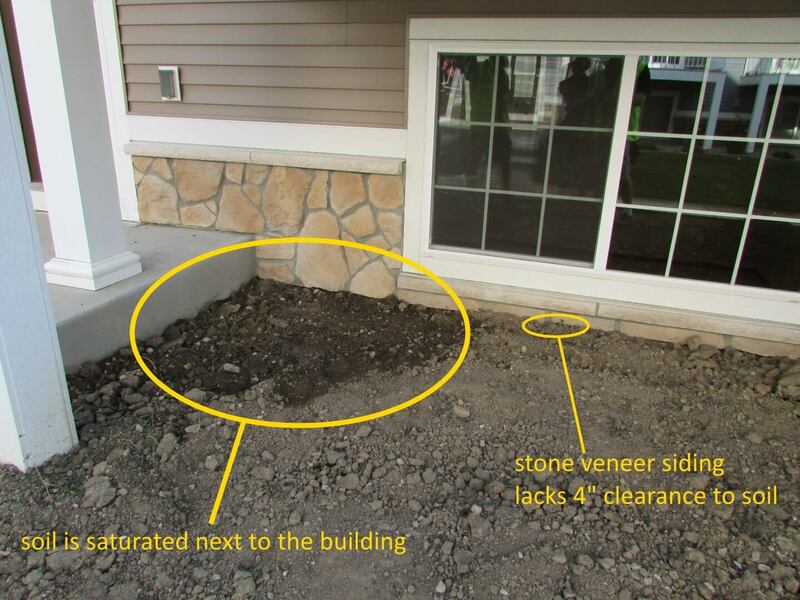 There should be a 4″ gap between the bottom of the stone veneer siding and the earth. How does one even fix all of this stuff? There’s not much that can be done about the roof lines at this point, but adding gutters would do wonders for this situation. The homeowner should have gutters added, whether he had to pay for them out of his own pocket or not. The association wouldn’t allow gutters for aesthetic reasons, and less than a month the building was occupied, four of the units in this association ended up with basement water intrusion. The association had gutters installed shortly after that. 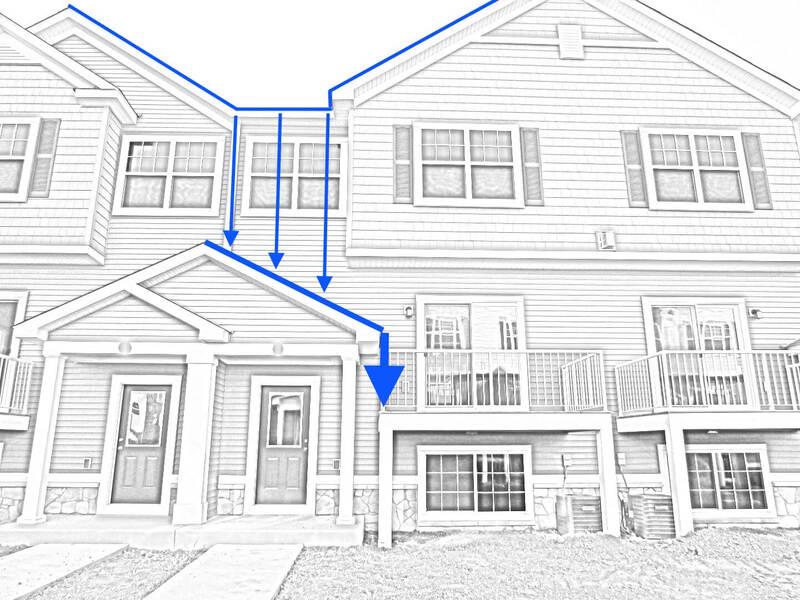 Installing gutters would probably help in all of the situations shown above, but gutters are something that should be planned for early on. If you’re having a home built, think about exterior water management. Take a step back and think about where all of the water will go. 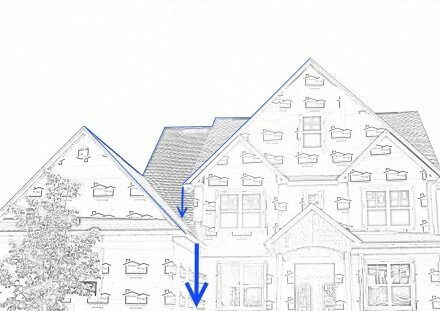 If gutters are going to be installed (and they almost always should be), make sure the downspouts have a good location to drain to. That means not onto a walkway, and not over a walkway. Sometimes, this involves laying down an underground drain. It’s cheap and easy to do this before the front walkways are poured. Not so much afterward.